But for many taxpayers, they will need to assess whether the new tables really are withholding enough money so that they're not saddled with a big bill when they file their taxes next year. The new tables are designed not only to best approximate the change in workers' tax liability under the new law, but to do so in a way that "delivers benefits as soon as possible to as many people as possible with as little disruption as possible," a senior Treasury official told reporters. The IRS is not issuing new Form W-4s ... yet. "We've constructed the tables so that most people should be accurately withheld if they leave their W-4 in place," a senior IRS official noted. The plan is to have new W-4s by 2019. Personal exemptions are a core feature of the current withholding system, but now that they are eliminated, "it's necessary to build a new approach to withholding, which will take some time," the senior IRS official said. 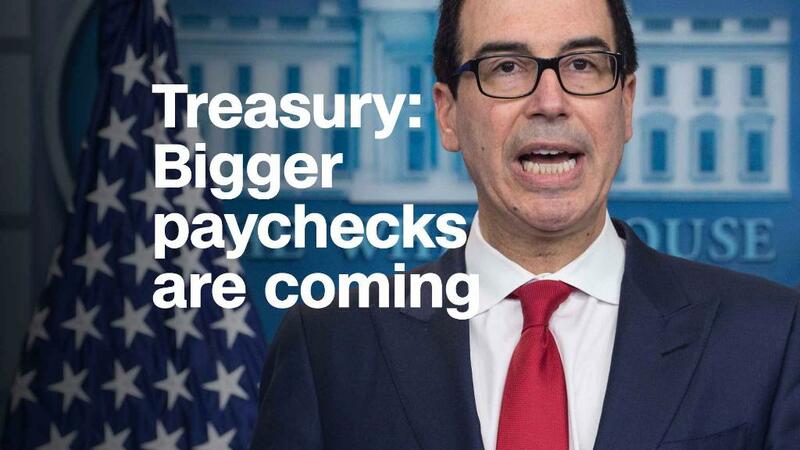 In the meantime, he urged filers who have complicated tax situations -- i.e., anyone who is not single, childless and holding down just one job -- to review the number of allowances they currently take on their W4s once the IRS puts out its new withholding calculator by the end of February. Such a calculator will ask for anonymous inputs -- for example, your income, number of dependents and other pieces of information that help determine whether you might be eligible for various tax breaks. "We would encourage every taxpayer to run their information through the calculator. Then they can decide what they want to do," the senior IRS official said. That's not bad advice for any year when there are big tax changes but it's especially critical this year. Most people fill out their W-4 form when they're hired at a new job and don't change it unless they get married, have kids, get divorced or experience other life-changing situations. And roughly three-quarters of tax filers are overwithheld because they take too few allowances. And that results in a refund when they file their tax returns. The IRS doesn't expect that to change much under the new tax law given the preference filers have shown for getting big refunds, rather than just breaking even or having to cut a new check to Uncle Sam when they file their returns. "Republicans are using brute force and speed to implement a law that will deliver a financial blow to hardworking Americans all across the country," Sen. Ron Wyden, the top Democrat on the Senate Finance Committee, said in a statement. "I look forward to GAO's independent review of these tables, which will expose whether the Trump administration is tampering with Americans' paychecks, resulting in a whopping tax bill next year," Wyden said. The GAO has said Wyden's request must go through its usual review process before a decision to proceed is made. Treasury Secretary Steven Mnuchin at the White House press briefing on Thursday dismissed suspicions that administration is "juicing" the tables as a "ridiculous charge."